In late July of 2008 a British solar plane set an unofficial flight-endurance record by remaining aloft for more than three days straight. Lithium-sulfur batteries emerged as one of the great technological advances that enabled the flight -powering the plane overnight with efficiency unmatched by the top batteries of the day. Ten years later, the world is still awaiting the commercial arrival of "Li-S" batteries. But a breakthrough by researchers at Drexel University has just removed a significant barrier that has been blocking their viability. Technology companies have known for some time that the evolution of their products, whether they're laptops, cell phones or electric cars, depends on the steady improvement of batteries. Technology is only "mobile" for as long as the battery allows it to be, and Lithium-ion batteries – considered the best on the market – are reaching their limit for improvement. With battery performance approaching a plateau, companies are trying to squeeze every last volt into, and out of, the storage devices by reducing the size of some of the internal components that do not contribute to energy storage. Some unfortunate side-effects of these structural changes are the malfunctions and meltdowns that occurred in a number of Samsung tablets in 2016. Researchers and the technology industry are looking at Li-S batteries to eventually replace Li-ion because this new chemistry theoretically allows more energy to be packed into a single battery – a measure called "energy density" in battery research and development. This improved capacity, on the order of 5-10 times that of Li-ion batteries, equates to a longer run time for batteries between charges. The problem is, Li-S batteries haven't been able to maintain their superior capacity after the first few recharges. It turns out that the sulfur, which is the key ingredient for improved energy density, migrates away from the electrode in the form of intermediate products called polysulfides, leading to loss of this key ingredient and performance fade during recharges. For years scientists have been trying to stabilize the reaction inside Li-S battery to physically contain these polysulfides, but most attempts have created other complications, such as adding weight or expensive materials to the battery or adding several complicated processing steps. 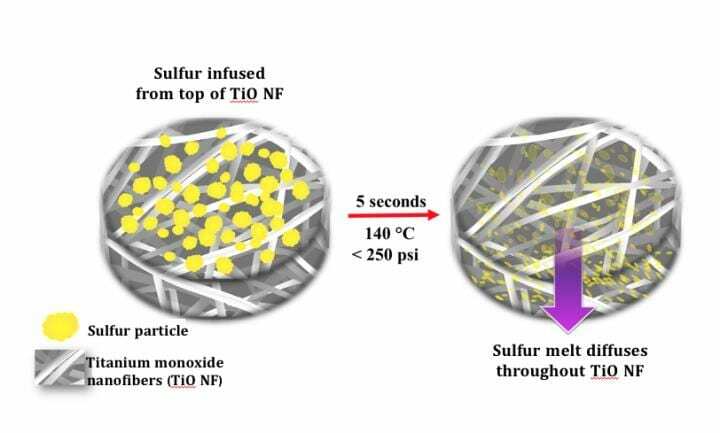 But a new approach, reported by researchers in Drexel's College of Engineering in a recent edition of the American Chemical Society journal Applied Materials and Interfaces, entitled "TiO Phase Stabilized into Free-Standing Nanofibers as Strong Polysulfide Immobilizer in Li-S Batteries: Evidence for Lewis Acid-Base Interactions," shows that it can hold polysulfides in place, maintaining the battery's impressive stamina, while reducing the overall weight and the time required to produce them. "We have created freestanding porous titanium monoxide nanofiber mat as a cathode host material in lithium-sulfur batteries," said Vibha Kalra, PhD, an assistant professor in the College of Engineering and lead author of the research. "This is a significant development because we have found that our titanium monoxide-sulfur cathode is both highly conductive and able to bind polysulfides via strong chemical interactions, which means it can augment the battery's specific capacity while preserving its impressive performance through hundreds of cycles. We can also demonstrate the complete elimination of binders and current collector on the cathode side that account for 30-50 percent of the electrode weight – and our method takes just seconds to create the sulfur cathode, when the current standard can take nearly half a day." Their findings suggest that the nanofiber mat, which at the microscopic level resembles a bird's nest, is an excellent platform for the sulfur cathode because it attracts and traps the polysulfides that arise when the battery is being used. Keeping the polysulfides in the cathode structure prevents "shuttling," a performance-sapping phenomenon that occurs when they dissolve in the electrolyte solution that separates cathode from anode in a battery. This cathode design can not only help Li-S battery maintain its energy density, but also do it without additional materials that increase weight and cost of production, according to Kalra. To achieve these dual goals, the group has closely studied the reaction mechanisms and formation of polysulfides to better understand how an electrode host material could help contain them. "This research shows that the presence of a strong Lewis acid-base interaction between the titanium monoxide and sulfur in the cathode prevents polysulfides from making their way into the electrolyte, which is the primary cause of the battery's diminished performance," said Arvinder Singh, PhD, a postdoctoral researcher in Kalra's lab who was an author of the paper. This means their cathode design can help a Li-S battery maintain its energy density – and do it without additional materials that increase weight and cost of production, according to Kalra. Kalra's previous work with nanofiber electrodes has shown that they provide a variety of advantages over current battery components. They have a greater surface area than current electrodes, which means they can accommodate expansion during charging, which can boost the storage capacity of the battery. By filling them with an electrolyte gel, they can eliminate flammable components from devices minimizing their susceptibility to leaks, fires and explosions. They are created through an electrospinning process, that looks something like making cotton candy, this means they have an advantage over the standard powder-based electrodes which require the use of insulating and performance deteriorating "binder" chemicals in their production. In tandem with its work to produce binder-free, freestanding cathode platforms to improve the performance of batteries, Kalra's lab developed a rapid sulfur deposition technique that takes just five seconds to get the sulfur into its substrate. The procedure melts sulfur into the nanofiber mats in a slightly pressurized, 140-degree Celsius environment – eliminating the need for time-consuming processing that uses a mix of toxic chemicals, while improving the cathode's ability to hold a charge after long periods of use. "Our Li-S electrodes provide the right architecture and chemistry to minimize capacity fade during battery cycling, a key impediment in commercialization of Li-S batteries," Kalra said. "Our research shows that these electrodes exhibit a sustained effective capacity that is four-times higher than the current Li-ion batteries. And our novel, low-cost method for sulfurizing the cathode in just seconds removes a significant impediment for manufacturing." Since Zephyr-6's record-setting flight in 2008, many companies have invested in the development of Li-S batteries in hopes of increasing the range of electric cars, making mobile devices last longer between charges, and even helping the energy grid accommodate wind and solar power sources. Kalra's work now provides a path for this battery technology to move past a number of impediments that have slowed its progress. The group will continue to develop its Li-S cathodes with the goals of further improving cycle life, reducing the formation of polysulfides and decreasing cost. This research was supported by Drexel Ventures Innovation Fund and National Science Foundation (CBET-1150528).